Movavi Video Editor for Windows 7 - A handy video editor with a large library of effects and filters. The program allows you to add multimedia data of any format, supports importing photos, recording stream from external devices and non-digitized video materials. The application is able to correct the clarity and quality of the output image, improve the stabilization and color reproduction, includes automatic and manual conversion. The editor contains more than 160 effects, a module for adding titles, superimposing audio tracks and converting finished videos and then uploading to YouTube or Facebook. 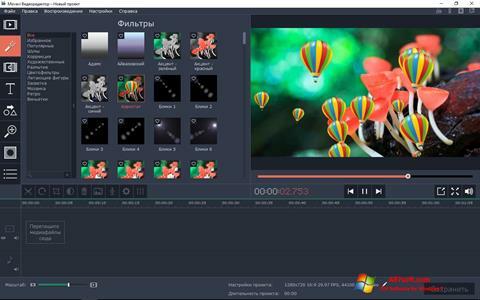 You can free download Movavi Video Editor official latest version for Windows 7 in English.